The U.S.-Mexico border is much more than just a line on a map. It is an open wound, a line in the sand, a political construct, a paradoxical place of division and connection, a marker of imagined projections of territorial power, a place that eludes state control. * Over the course of the past two hundred years, the border has transformed from a shifting line on maps, to a “line in the sand,” to an increasingly marked, built, and “fixed” border. Today’s border dissects so many things, yet it remains porous. People, animals, pathogens, drugs, money, ideas, religion, food, goods, water, and countless other things cross the border daily and nothing suggests that this movement will cease—no matter how big a wall we build. And yet, many who study the U.S.-Mexico border treat the border as if there is something absolute about it: many U.S. historians who study the U.S.-Mexico borderlands never research south of the borderline. In Fugitive Landscapes: The Forgotten History of the U.S.-Mexico Borderlands, Samuel Truett writes that, “Most Americans have forgotten transnational histories not only because they have trusted maps of the nation, but also because they have succumbed to the siren-song of the state (p.5).” Many historians of the U.S.-Mexico borderlands fit this description, but we don’t have to, nor should we. Over the past year, I have made three separate trips to Mexico City to research for my dissertation, which is an environmental history of the U.S.-Mexico border. My work examines the ways in which the natural environment has both prompted and stifled fence construction along the borderline and how built structures have changed the nature of migration across the border. I highlight the ways in which dynamic nature: people, animals, and pathogens naturally move across space and simply have no regard for unnatural boundaries. As human and non-human organisms cross the line, despite the increasingly rigid boundary, they move into different national territories, but their stories do not end. Conducting research across borders allows us to tell their stories more fully, it makes our work stronger, and it shows us connections that we may not be able to see from just one side of the border. In Mexico City, there is a wonderful group of historians who get together regularly. Many of them are from the United States, but they study Mexican and/or Latin American history—only the tiniest fraction of these scholars consider themselves U.S. historians. At one of our many gatherings last fall, this came up as a topic of conversation and I have not stopped thinking about it since. That evening, some of my friends who have spent significant amounts of time in Mexico City noted that they had only met a handful of U.S. historians who had traveled to Mexico for research and that surprised me. In the following months, I attended a few conferences and talked to many colleagues who write about cross-border migration or the U.S.- Mexico borderlands. Thinking back to my fall conversation, I asked them, “Have you done research in Mexico?” Initially, I thought that perhaps my colleagues in Mexico City might be wrong—perhaps they just had not met the U.S. historians who had traveled to Mexico. But the more I asked, the more I heard, “No, I haven’t done research in Mexico.” When I asked why, I heard an array of answers, but the most common were “it’s too dangerous” or “I’m not sure it would be worth it” or “I don’t speak Spanish [at all or very well]” or “I can’t afford it.” This post is meant to encourage more of us to do transnational research and to provide a few resources to help with the planning process. Though large cities can be dangerous, there are several ways to ensure your safety in Mexico City: only take official taxis, never leave your belongings, don’t walk long distances alone at night and so on. As in any large city, common sense is invaluable. Second, if you are working on a project that involves cross-border movement of anything, then the trip will be worth it. The border is a place where two countries meet and writing a complete history of that shared and contested space really must include sources from either side of the line. 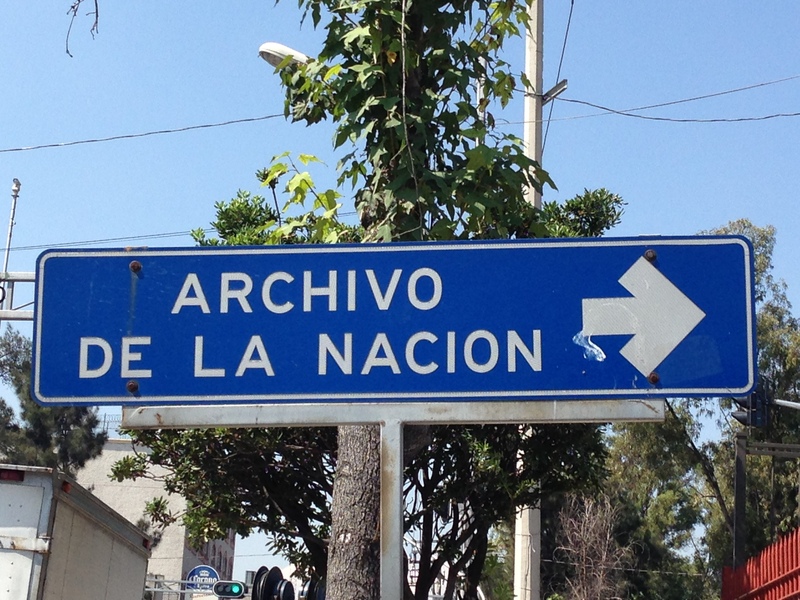 Mexico City has a number of archives that could be useful for any scholar of the U.S.-Mexico border and you may be surprised at what you will find to compliment the research you have done north of the border. During my trip last fall, I found an entire folder at the Archive of the Secretaria de Relaciones Exteriores (Secrertary of Foreign Relations, SRE) that was dedicated to a rancher from South Texas who appears in Chapter One of my dissertation. The file not only filled in some of the gaps from my initial descriptions of this man, but it also provided information about what Mexican cattle ranchers thought of him. I was shocked to find so much information about an important character in one of my chapters and that folder alone would have made the trip worth it. There are many archives that cover an array of topics in Mexico City. On my most recent trip in March, I visited a museum near the archive I was visiting and found that inside that museum, there was another small archive dedicated to U.S. interventions in Mexico since the U.S.-Mexican War. No matter what you are studying, there is likely an archive somewhere in the city that has useful material. At the end of this post, I have provided a working list of archives in Mexico City. Please feel free to add to it in the comments section if you know of an archive that is not on this list. Beyond that, some collections from Mexico have been digitized and are available online. Tracy Goode has provided some information on that here. As borderlands historians, we must make the effort to do cross-border research as we “challenge the assumption of closure.”*** If the things that we study are moving across national borders, then we should too. Asociación Gral. y Lic. Aarón Sáenz Garza, A.C.
Asociación Mexicana de Estudios Fonográficos, A.C.
Centro de Investigación del Estudio de Salvador Novo, A.C.
**Cornell University has an extensive database of fellowships available. That might be another good place to look for grants and fellowships for research. ****This is not a complete list and not all of these archives are open to the public. Many require a letter of introduction and/or a university ID. Some require government permission. This list and blog post are by no means all of the information that you need to do research in Mexico, but rather to help provide a place to start. Always look into what is required for each archive before you travel. *****Many thanks to Veronica Castillo-Muñoz, Tracy Goode, Laura Gutierrez, Romeo Guzman, and David Reid for their input on the archive list and to the National Science Foundation’s REACH/IGERT program, the University of California-Davis History Department, and the UC-Davis Hemispheric Institute on the Americas for funding my Mexico City research trips.